We recommend two spots at Danyang as summer healing destination. First, we will recommend Sainam Rock. Sainam Rock, located in Sainam-ri, Daegang-myeon, is one of eight scenic areas in Danyang, and is located in the southeast side of Danyang-gun, along with Sangseonam Rock, Jungseonam Rock, and Haseonam Rock of Seonam Valley.The Sainam Rock is a rugged outcropping with an inspiring height of 70 meters, and the deep blue Namjocheon Stream passes in front of it, located in the southern part of Danyang-gun. Most visitors to Danyang Eight Scenic Views tend to come to the rock as their first destination due to the good condition of the road. Also, Unseongugok Valley flows in front of Sainam Rock. The rock was picked as the most picturesque place among the Eight Scenic Views. 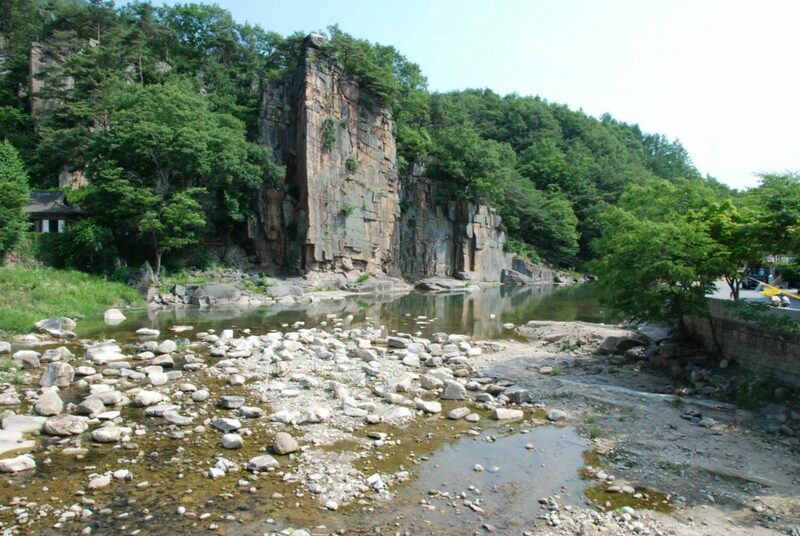 On the cliff, there is a phrase carved by Utak’s own handwriting, as well as old pine trees on a rock floor that is reminiscent of the Haegeumgang River. Sainam was named after the great scholar Yeokdong Utak during Goryeo Period. He had taken up a public service to assist a king in a position called sain (사인), and then he retired to his hometown of Danyang, starting out teaching young students. For this story, a governor of Danyang named the rock Sainam to commemorate his achievement during King Seongjong of the Joseon Dynasty. You can enjoy the view from bridge too. Direction to go here: From Dong Seoul Bus Terminal or Central City Terminal, take an express bus to Danyang Bus Terminal. Cross the street and take a local bus bound for Gosudaegyo Bridge and Banggok (Danseong). Get off at Danyang Danuri Center and continue walking in the same direction, and then take a left in front of Jikteogyo Bridge. Walk for 577 meters from the bus stop to the rock. Second destination is Danyang Jungseonam. River flows between the rock becomes one of eght areas designated as the most beautiful sceneries in Danyang. How to go here? From Dong Seoul Bus Terminal, take an intercity bus to Danyang. From Danyang Intercity Bus Terminal. – Janghoenaru: Take a local bus to Janghoenaru at the bus stop in front of the entrance of Gosu Bridge. (1 hour intervals, 30min-ride) – Dodamsambong: Walk along the Sambong-ro Road to arrive at the bus stop. Take a local bus bound for Dodamsambong (도담상봉). (1 hour intervals/ 15min-ride) After walking around, you can enjoy one of the most popular restaurant here. This restaurant serves duck meat as their main menu. Korea’s No1. House & Experience sharing network. Book unique & affordable private apartments, rooms and guest houses for your Korea trip!